Home » Blog » Making Music » Our musical journey to Cape Town! 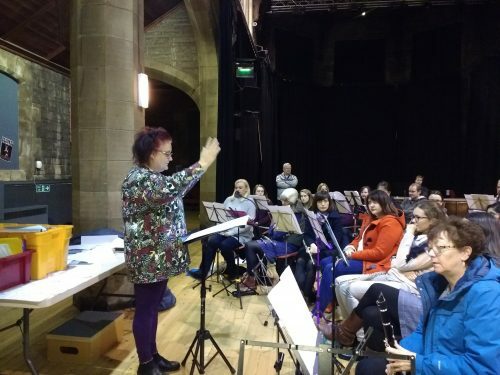 We had the pleasure to welcome Gaynor Barradell, our amazing composer from #AdoptaComposer (AAC), for her second visit at our weekly rehearsal on Tuesday this week. Now that she had already met the band and familiarised herself with our style and level of playing music, she decided to run an hour-long workshop with us. She was accompanied by her mentor David Horne from AAC, a Scottish composer, pianist and teacher who has been given a lovely warm welcome by the whole band. We were already “warned” in advance of this week’s rehearsal that the workshop was in the making and that we should be open minded to try out a few new things including a bit of ‘jamming’. Once I heard about the potential jam session, I was slightly nervous but much more so, excited to see what Gaynor had in store for us. The whole band was pleased to get another opportunity for Gaynor to get to know us and our musical preferences a little more in-depth. After all, she will be composing a piece of music for us, so we wanted to make sure that we help her as much as we can along this musical journey. 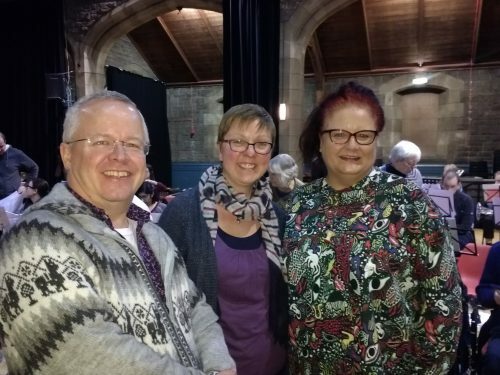 I arrived a little bit early to the rehearsal on Tuesday and as soon as I entered our venue there was a real buzz about the place: It seemed like lots of bend members had made an effort to get there a bit early and sought the opportunity to speak to Gaynor and David before the rehearsal. Gaynor broke the ice by introducing her mentor David and by telling us a little bit more about the planned workshop for that evening. The slight nervousness on both sides was quickly put aside with a few jokes that put us all in the right mood for the adventure we were sent on next. 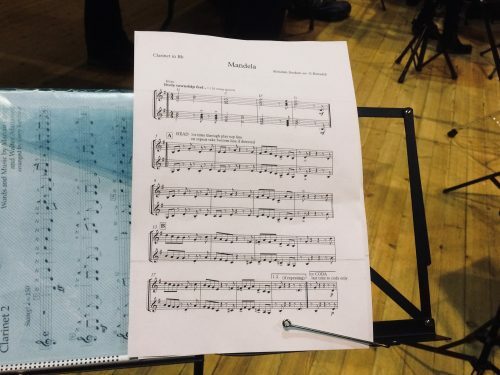 Gaynor had arranged Abdullah Ibrahim’s ‘Mandela’ for the band, which she asked us to sight-read as part of the workshop. Once we got warmed up the music immediately transferred us to the Streets of Cape Town: I could visualise local street musicians swinging and grooving away to this authentic South African music. Gaynor encouraged all band members to pick and choose the parts that they most enjoyed playing and firstly got us to focus on playing in harmony with our section partners by tuning in on what they were playing. A few of us then played improvised solos and each section was asked to play specific themes of the music, which brought this piece of music to life. If you ask me, I could have went on for another few hours playing this jazzy South African street music, as the time had passed far too quickly. It was a pleasure to see everyone in the band being pushed out of their comfort zone, trying something new that we don’t do every week. I for one had a great and fun-filled workshop experience and hope that Gaynor has enjoyed the workshop as much as we did! As this is only beginning of our AAC journey, I am already looking forward to our next workshop, where we might get a sneak peek on first parts of our composition.